YVETTE CUTHBERT, Artist – The most visible creators I know are those Artists whose medium is life itself! It’s definitely difficult, possibly impossible to portray Canada in a limited series of images, but Portage la Prairie artist Yvette Cuthbert has come eerily close. In celebration of Canada’s 150 birthday celebration, Cuthbert embarked on what can only be labeled an ambitious project to create 150 paintings of Canada, in predominantly red and white. Each measuring a square foot, the Portage la Prairie artist’s brush strokes are on fire in the series she has thus far completed 140 pieces, the collection is a vivid portrait of the Canadian psyche. Who cannot remember in our youth being taunted by friends to stick our tongue on a frost fence? The artist explains her personal challenge to select 150 topics for the project, “will re-kindle your memories. 150 paintings of Canada will teach visitors something new about Canada: did you know camels were used during the Gold Rush and Flin Flon has sewer boxes for homes built on solid rock? The paintings also help us revisit Canadian feelings about nature, landscapes, animals, sports and iconic everyday images like shoveling snow and historic sites. It is almost impossible to capture the many Canadian icons that either helped build a nation or helped Canadians develop culturally, but the collection does an excellent job. Visitors stating ‘what about?…only makes the artist smile. “I know then they have enjoyed the display and are wrapped up in thinking about Canada, its history and how they remember it. That is a good feeling,” she said. 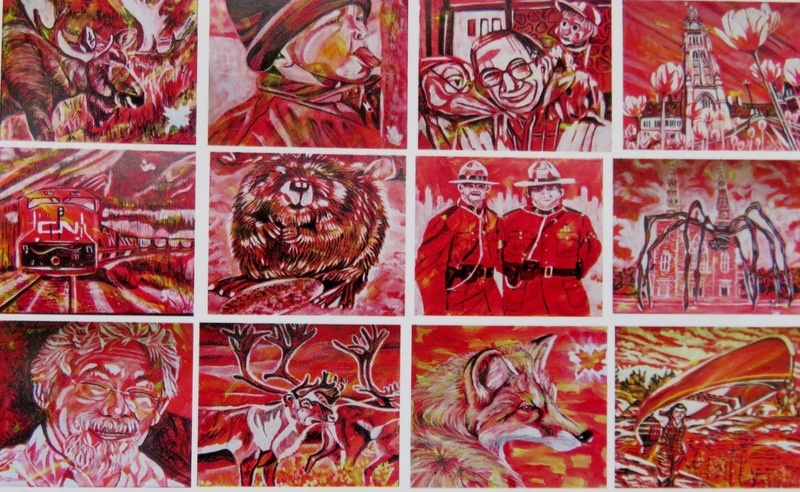 Celebrate Canada is 150 images of Canada painted in predominantly red and white. The majority of the paintings are done in only red, white, some yellow and black, the odd one at the beginning has other colours added. Initially they all included a maple leaf as well but I strayed from that. They are all painted in acrylic, and all have had a stencil cut for them for the areas that are white. They were all painted by myself, Yvette Cuthbert. The exhibit consists of 150 images, all one foot square each. In the last exhibit they were hung 5 from floor to ceiling with about 2” between them, and in 30 columns. If more space is available, hung only 3 or 4 deep would be great. The last time they were exhibited I tried to have one wall of indigenous and nature, one of sports, childhood memories, and iconic people/shows, the centre wall I put everything else, historical sites, images of Canada’s charter of human rights and freedoms, inventions, braille on money, industry…. They don’t need to be hung in any particular order though keeping Canada’s charter of human rights and freedoms images are easier to explain close together. Otherwise just balancing paintings that are stronger white or stronger red is a good idea. For shipping 10 canvases fit in a re-usable shopping bag (12 1/2” x 12 1/2” approx.) usually 10 in a bag, they are about 7 1/4”- 7 1/2” wide, face to face and back to back. So they don’t take up much space considering the number of them.